First day of action is done, and for the most part, the pros had their way. Some of the notable stacks include: Lee Watkinson – 160,000, Edouart Cardona – 130,000, Dustin “Neverwin” Woolf – 69k, Layne Flack – 61k, Clonie Gowen – 50k, Greg Raymer – 49k, Reza Payvar – 38k. Two guys we noted as strong players are still doing well. Andrew Prock has over 60k, and Patri Friedman is over 52k. 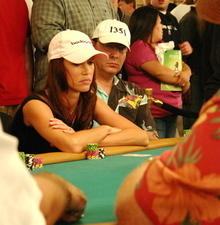 Even Shannon Elizabeth is hanging on, with around 8k in chips. Today we’ll be following two of the 4th Street Poker guys, Dino and Von Sandman, as well as the featured ESPN table, which right now has Sam Farha and Daniel Negreanu.